The Kalam in the Kali cult, denotes a floor painting of the goddess. Before the form of the goddess is painted, a Chakra in the tantrik structure is drawn using two colours, white and yellow made respectively of rice and turmeric flour. On the north eastern corner (minakon) is the place in which the image of Kali is proposed to be drawn. At the centre of this drawing, a bronze oil lamp is lit in the belief that with the lighting of the lamp on the Chakra, the goddess has made her divine presence at the spot. Before the lamp is placed on the floor a plantain leaf with offerings to the goddess like paddy, rice, coconut etc is placed. Painting the image of the goddess, using herbal and grain powders of different kind is a consummate art. The dhulisilpam (the powder made image) attains supreme perfection by meticulous care in furnishing all its subtle details. To paint an image of Kali with sixty-four arms, more than fifteen persons is required. The Kalam is painted in multi colour. The Kalampattu begins with the beginning of the Kalam itself. The Brahmin priest is assigned the privilege of doing the first special puja of the image before the onset of the Kalampattu. Kalampattu is a kind of song sung by persons belonging to different castes which are lower down in the caste hierarchy. Kaniyan draws the Kalam of Gandharva, and Pulluva that of serpents. Vannan uses a stringed instrument called Nantuni. The Kurup who sings Kalampattu uses a percussion instrument with cymbals and gong as accompaniments. The paintings of the Kalam commences with a ritual called Uchappattu (noon songs). The Kalam would be completed by evening. The singers sit in a thatched shed in front of the courtyard of the temple or the house in which the ritual is conducted. The shed is decorated elaborately with plantain trunks, with leaves and bunch of fruits, tender coconut leaves, gold coloured tender coconut bunches, mango leaves and flowers. Inside the shed beneath the thatched roofing is a red canopy. The floor is plastered with cow dung. The painting of the goddess is made on this plastered floor. The size and dimension of the image of Kali are decided according to the deity. Normally, the image has sixteen hands with a weapon in each hand. The size of the image can be as big as to have sixty four arms and breasts each big as five paras (measures) of rice heaped and bedecked with paddy stalks malted into delicate forms. Ornaments of a rich variety are drawn on the image with coloured powder. The song goes on without a break round the clock. It starts with an invocation to Ganapathy, the god that clears his devotees path of all hurdles, passes on to the story of the confrontation between Kali and her demon-rival, Darika and ends up with the slaying of the demon by the goddess. The entire song is known by the name tottam, which means 'to awaken the deity'. To mark the end of the ritual of Kalampattu, the figure of Kali is wiped out, starting from the feet upwards, but keeping the breast untouched. 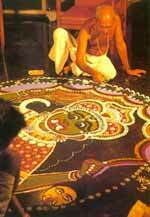 The powder used for painting the breasts is then worshipfully collected for distribution as prasadam to the devotees. The Kalampattu is associated with some ritualistic dance performances. The dancer is the descendant of a line of ritual dancers, the counterparts of the oracle and the shaman. The ritual dance is known as itum kurum chavittu. The goddess is believed to enter into the body of the ritual dancer and into the Kalam and the presence is manifested differently in the two media. In the dance, the goddess express herself through the ritual dance, while in the Kalam, she makes her presence felt by its flowing patterns and colours. As the ritual dancer gets possessed by goddess, his limbs move and he utters uncontrollably. The movements and utterances rise slowly in a crescendo and reach their highest pitch and then abruptly stop. The possession leaves the body and the dancer falls exhausted and unconscious. The ritual dancer visits the houses of the devotees and receives offerings to the goddess in the form of rice, coconuts which are the symbols of fertility. Kali may bless or curse with her disease, the small pox. Such blessing or curse is considered her playfullness or revelry, 'amma vilayattam'. If Kali is wreaking her wrath, the disease might take a fatal turn and is taken to be an omen of impending doom on the land.